Sergei Eisensteins Battleship Potemkin (1925) remains one of the greatest achievements in cinematic history. Initially intended as one of many sequences within a broader film to mark the anniversary of the 1905 Russian Revolution, the tale of the sailors mutiny against their atrocious conditions, the enthusiastic support it received from the working class of Odessa, and the vicious reprisals of the Cossacks came to embody the entire experience of that defeated revolution. In 1925, Russian society looked back on 1905 in the light of the experience of a successful revolution. October 1917 unleashed a huge wave of revolutionary potential in all spheres of life, including the arts. As Russian workers attempted to forge the basis for a new society, artists found themselves not only inspired by the achievements of the revolution but also able to develop new creative techniques to reflect that inspiration. Eisensteins development of techniques of montage (which he compared to the explosions within a combustion engine that propel a car forward) allowed him to create an artistic representation of the very movement of classes in the revolutionary situation. Battleship Potemkin was the last of Eisensteins films to reflect completely the development of artistic freedom created by the revolution. As the Stalinist bureaucracy tightened its grip on the Soviet Union by the increasingly brutal suppression of its Marxist opponents, Eisenstein came under pressure to adapt his historical epics to the requirements of the ruling clique. His tribute to the revolutionary workers of Petrograd, October (also known as Ten Days That Shook The World), for example, suffered from having all references to Leon Trotsky removed by the bureaucracy. What he was allowed to show of Lenin in that film was also dictated by the immediate line of Stalinist policy. However, even though he was coming under a direct pressure that was to last for the rest of his career, he did not waver in his determination to make films that reflected the revolutionary achievements of the Russian working class. Battleship Potemkin, the most fully realised of his films, captures the brutality of the regime that the workers and sailors tried to overthrow, their heroism in facing down that regime, and the savage reprisals unleashed against them. This whole movement of the revolution is captured in some of the most stunning and iconic images ever committed to film. It is a film that remains passionate, committed and optimistic, even in the face of the most brutal repression. It speaks urgently to viewers today of historical lessons, both political and artistic. That the film remains emotionally compelling is precisely because it embodies an understanding of that revolutionary epoch and an attempt to capture it artistically. Eisenstein himself regarded Battleship Potemkin as a film that would remain contemporary in character, apparently calling for a new score to be written for it every 10 years. It was, therefore, entirely fitting for it to be shown in Londons Trafalgar Square with a newly commissioned score. The event was programmed by the departing director of the Institute for Contemporary Arts (ICA), Philip Dodd. Dodds conception was that Trafalgar Square, as the site of so many major demonstrations over the years, is a political centre of London. To this end, he commissioned Simon McBurney of Theatre de Complicite to narrate a potted history of the Square over a film sequence of demonstrations before the film itself. Dodd also commissioned a new score for the film from the Pet Shop Boys, which they performed with the Dresdner Sinfonica. Over some rather trite images of clenched fists picked out in red, McBurney read some of the comments of Karl Marx (who lived nearby) and Frederick Engels (who wrote about the London slums cleared for the redevelopment of the site in 1843). This was the one time that his presentation came alive: here was both a clear-sighted assessment of the poverty being faced by the majority of the population, and the elaboration of a revolutionary programme to end it. But the references to Marx and Engels amounted only to paying lip service to the films content. Here, after all, was an event co-sponsored by a business consultancy firm and a Russian brewery. It was to be radical, but not too radical. If a large proportion of the audience were there to hear the Pet Shop Boys, and knew nothing previously of the film, the invocation of the great pioneering Marxists would be far from sufficient to explain to them why there was a revolutionary upsurge in 1905. Many of the thousands in the audience were unable even to read the films subtitles because of the placing of the screen. The event was about images, not about content. That, at any rate, was the conclusion I came to after hearing the Pet Shop Boys score for the film. There is nothing inherently wrong in the idea that a synthesiser pop duowho have a certain reputation for intelligent and ironic lyrics and an avant garde sensibilitymight be able to produce a contemporary score for a silent film. It would be quite possible to produce a score with such instruments, which have a certain flexibility and range. The requirement, as with any instrumentation or style of composition in this context, must be that the music enhance and augment the film. The music should not dominate the film, nor should it betray the films vision. It can rather, as Eisenstein seems to have suggested, renew a films contemporary resonance. To produce a score for Battleship Potemkin, however, it is necessary to understand the film. This would involve an engagement with the political conceptions that drove Eisenstein to create this tribute to the heroism of 1905. It would involve an understanding of 1905, and of the lessons that were learnt from it. It would require an honest assessment of the explosion of revolutionary events after 1917. And, I would add, it must also involve a degree of understanding of the betrayal of 1917 by the Stalinist bureaucracy, which was able to assert its power only through the physical destruction of communistsso that one avoids the easy portrayal of the idealism that animated the Potemkin sailors and Eisenstein himself as simply utopian dreaming. What we got, though, was something else entirely. There was the possibility of bringing one of the greatest works of art of the twentieth century into a sharp new focus. The event, though, was geared towards the Pet Shop Boys, and their lack of understanding of the film militated against such a possibility from the start. 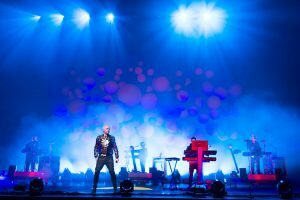 The Pet Shop Boys, Neil Tennant and Chris Lowe, have been making records for some 20 years. Tennant is a former music journalist, whose ability to write in waspish sentences has elevated him to the status of an intellectual in the pop world. He writes with detachment and irony, marrying his light voice with Lowes dance beats. They have written pretty tunes, with an air of substance about them thatthough in reality fairly slightis given added emphasis by the even more insubstantial character of most popular music. What we got in Trafalgar Square was a cruel exposure of the flaws in their music. They seemed too content to allow a dull dance rhythm to persist, regardless of what it was supposed to be informing. Many of the early scenes of the battleship at sea were simply accompanied by shapelessly swirling chords, often suggesting they were unaware of the structure of the film they were accompanying. (Tennant has said I kept counting down: only 73 and a half minutes to go.) Their own songs often abandon dynamic development in favour of appearing arch: imposing this on Eisensteins carefully structured film only served to highlight how limiting this is. Sometimes they succeeded. Much of the time the score was unobtrusive and unexceptional, and allowed the film to move at its own pace. Occasionally, a small melody rose out of the rhythm, and there was some general agreement between sound and vision. At critical points, however, the score betrayed the film. When the ships crew mutiny after they are ordered to shoot down their comrades, one of their leaders, Vakulinchuk, is murdered. The sailors lay him in state on the dock at Odessa, and the workers file out in their hundreds to pay their respects. This moving sequence, of workers pouring down to the docks in ever greater numbers while they argue and discuss supporting the sailors, builds its momentum to the point at which the town throws in its lot with the mutineers. There are increasingly agitated speeches, mourning, arguing, disagreementsthe images have a definite escalating rhythm. Tennant and Lowe, though, accompanied this with a song lacking any momentum. They seemed unable to go along with the development of events. Similarly, the famous sequence on the Odessa steps, when the women and children are caught between the marching riflemen and the sword-wielding Cossacks, remains one of the greatest episodes in cinema history. It is a compelling emotional sequence, with every image (the woman shot in the eye, the mother killed beside the pram that then rattles down the steps, the boy trampled beneath the feet of the soldiers) a searing indictment of Tsarist brutality. While the images demand a score that was truthful to them, Tennant was singing plaintively, How come we went to war? It was an artistically and politically dishonest moment. The Odessa steps sequence highlighted the greatest problem for Tennant and Lowe. They not only failed to understand either the work of art they were accompanying or any of the events it portrayed, but they also actively resisted and opposed the content of the film. In one interview, Tennant said, Battleship Potemkin is a Bolshevik propaganda film. Though I said that to Chris [Lowe] and he said No, its a very romantic film about people rising up against oppression, its both, really. Such a reductive simplification of a complex work of art suggests that the task of interpreting it was always going to be beyond them. Furthermore, when Tennant adds, Then theres the question of whether it was good that the Bolshevik revolution happened, I think the answer has be no, it is clear that he cannot reflect on Eisensteins art in any constructive way. The song that accompanied the Odessa steps sequence, it appears, has nothing to do with Eisenstein and nothing to do with the 1905 revolution. Tennant asking How come we went to war? is the comment of a self-satisfied petty bourgeois who, looking at images of suffering, sacrifice and heroism, declares that it is not worth the candle. And whereas he may now feel somewhat foolish for supporting the US-British war against Iraq, he has no real sympathy or understanding for those who are prepared to take a stand in the struggle against the warmongers and the forces of oppression.